According to the Food and Drug Administration (FDA), millions of Americans have allergic reactions to food each year. Although most food allergies cause relatively mild and minor symptoms, some cause severe reactions and may be life-threatening. Following ingestion of a food allergen(s), some people with food allergies can experience a severe, life-threatening allergic reaction called anaphylaxis. This can lead to constricted airways in the lungs, severe lowering of blood pressure and shock, and suffocation by swelling of the throat. The appearance of symptoms after eating food may be a sign of a food allergy. The affected person should contact a doctor, health care provider, or workplace medical staff member immediately. 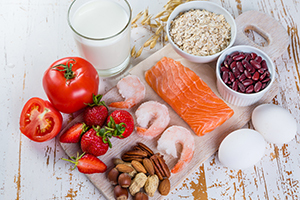 Awareness of common allergens and their subsequent symptoms can help minimize a scary and potentially life-threatening situation.